Your are not currently logged in. If you are a BSA member and wish to access AJB, click here. All members receive online access to the full run of the journal as a benefit of membership. Access to the years 1914 to Present is available by logging in as a member from this page. Applications in Plant Sciences (Online ISSN 2168-0450) is a monthly, online-only, open access, peer-reviewed journal promoting the rapid dissemination of newly developed, innovative tools and protocols in all areas of the plant sciences, including genetics, structure, function, development, evolution, systematics, and ecology. Given the rapid progress today in technology and its application in the plant sciences, the goal of APPS is to foster communication within the plant science community to advance scientific research. 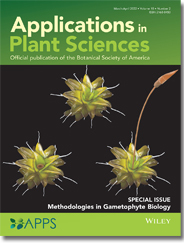 APPS is a publication of the Botanical Society of America, originating in 2009 as the American Journal of Botany's online-only section, AJB Primer Notes & Protocols in the Plant Sciences. Debuting in 2013 as a new journal, APPS has been expanded to address novel protocols, software reports, reviews, and applications of new technology in any area of the plant sciences. The Plant Science Bulletin (Print: ISSN 0032-0919, Electronic: ISSN 1537-9752) is an informal communication published three times a year, with information on upcoming meetings, courses, field trips, news of colleagues, new books, and professional opportunities. It provides a means of advertising items or materials wanted. It also serves as a forum for circulating BSA committee reports, for distributing innovative teaching approaches and methods, and for discussing issues of concern to Society members such as environmental policy and educational funding. Deadlines: To be included in the printed versions of PSB, submissions must be received by the editor no later than January 15th, May 15th, and August 15th to appear in the March, July, and October issues, respectively. Electronic submissions are particularly encouraged; announcements and articles requiring extensive retyping may be delayed to subsequent issues if received at deadline time. Access the Plant Science Bulletin ONLINE. Journal Access Login Instructions and FAQ. Still having trouble logging in? 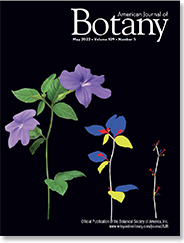 Contact us at bsa-manager@botany.org.